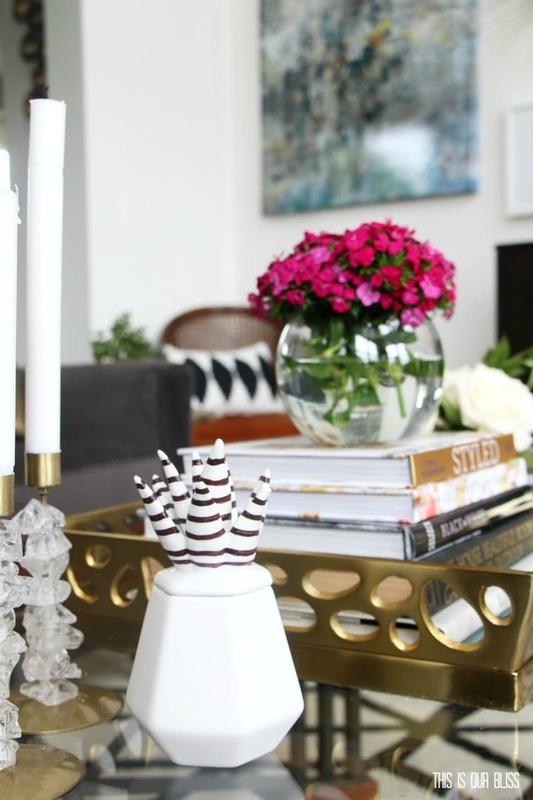 How to Style a Coffee Table Two Different Ways | 1 table + 2 looks! You are here: Home / DIY & Crafts / How to Style a Coffee Table Two Different Ways | 1 table + 2 looks! Hello! 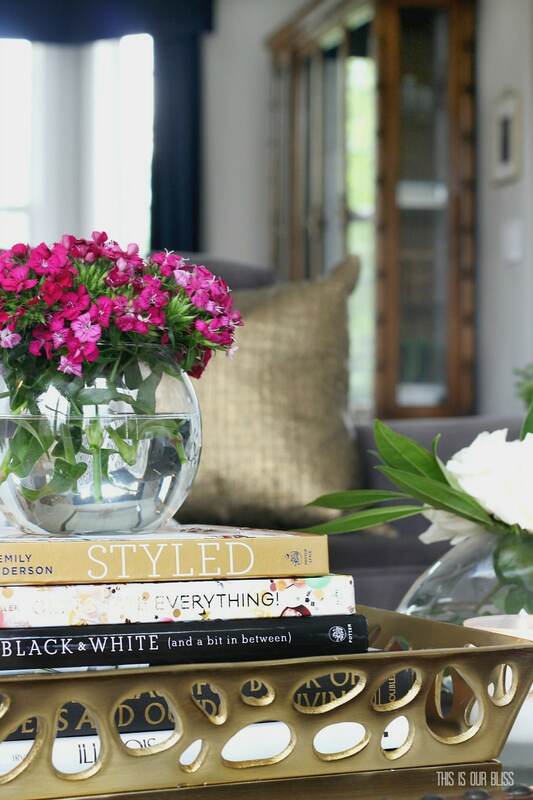 I’m so happy to be here today sharing a few styling tips, specifically showing you how to style a coffee table two different ways! Decorating your home shouldn’t feel like a chore. I know, easier said than done! But the most important thing to remember is that there are no rules when it comes to decorating your space. 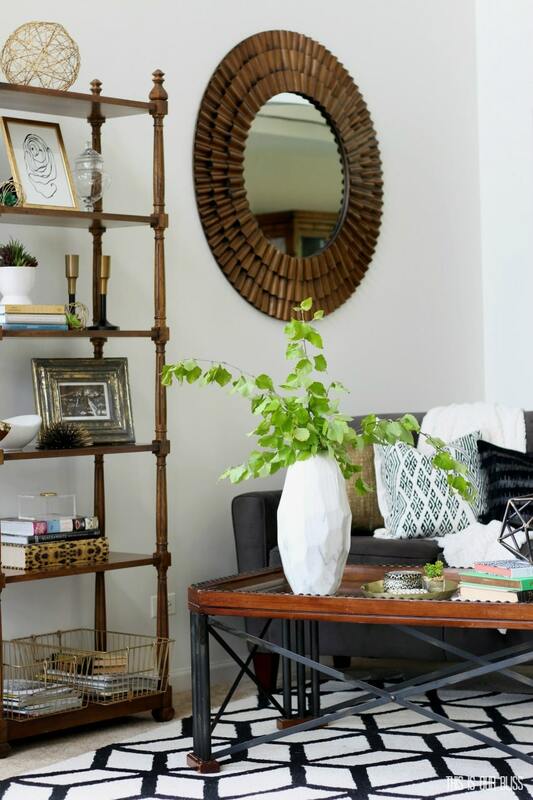 Use the things that you love and experiment with the placement of objects until your space looks and feels like YOU! For me, playing around with tabletops are by far the most fun. Whether it be setting a pretty tablescape, styling the nightstand or accessorizing the coffee table in the living room, which happens to be the room I enjoy sitting in the most. I recently scored a new-to-me cocktail table at our local thrift store and have had so much fun playing around with the accessories that sit on top. One reason I love the new table so much is because it has more surface area than my last table, which means more room for “mommy’s pretties” as my little guys refer to the decor around here! 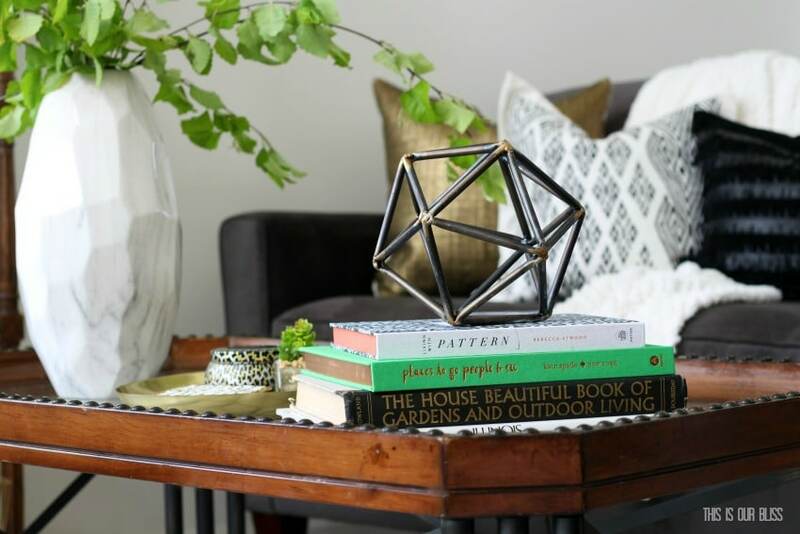 Today, I’m going to show you how I styled our coffee table 2 different ways — same table, but with two entirely different looks! At the end of the post, I’ll share my sources for everything you see, so you can snag an accessory or two if you gather any new ideas or inspiration. Come take a peek at the first style…I’m calling it the Fresh + Neutral Look. 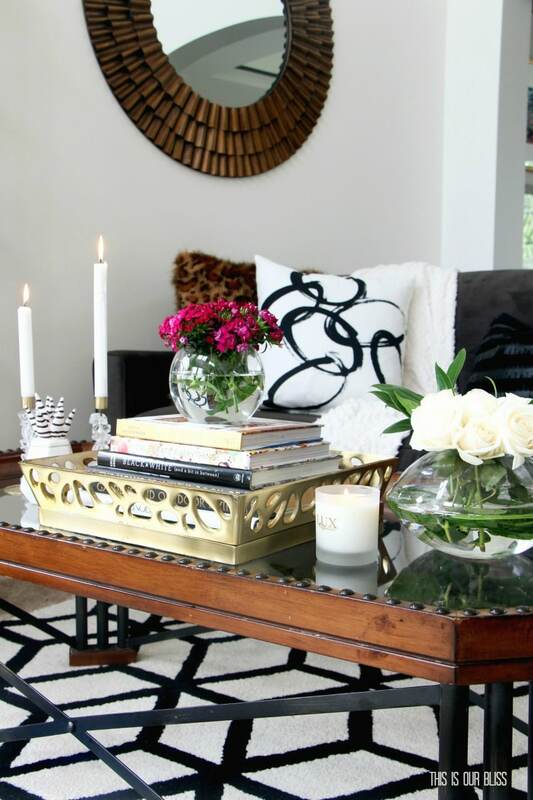 I adore decorating with fresh flowers, but truth be told, it can get quite expensive doing so! I treat myself occasionally, especially if I’m going to be shooting photos for the blog, but I think a few simple clippings from the yard look just as lovely. I snipped a few small branches from one of the trees in the backyard and stuck them in this faux marble faceted vase. The greens look great standing upright or spilling over the sides, hanging over the table. Fresh clippings are free and the greens look gorgeous paired with just about any accent colors! 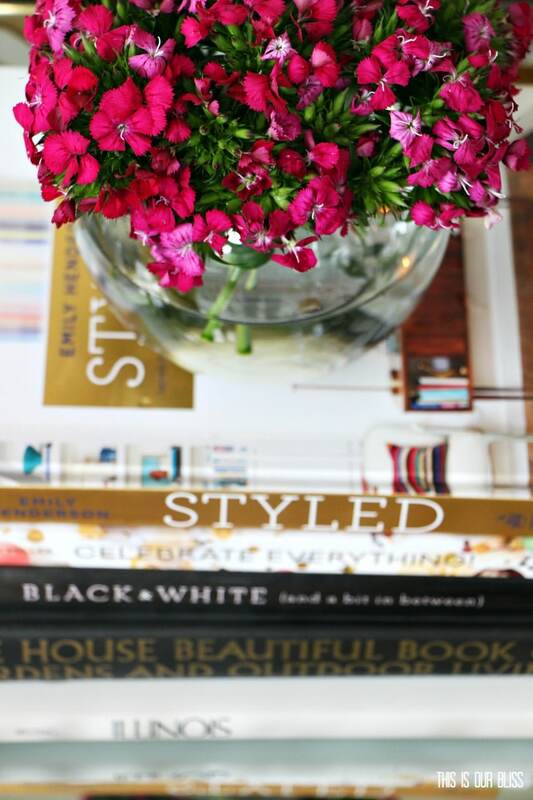 Coffee table books are one of the easiest way to achieve a “styled” look on your coffee table or any tabletop surface! They add height, color, are excellent conversation starters, especially if the books are special, unique or symbolic of you. These 4 books are several of my favorites and speak to my personal style. 1 – Living With Pattern – The second you step foot in our home, you’ll notice the bold and graphic patterns, so this one is especially symbolic of my style. Plus, the cover is a gorgeous black and white print and with fun, unexpected orange pages. 2 – Places to go people to see – I love Kate Spade. Need I say more? The cover and spine are a fabulous shade of Kelly Green and it ties the table to the fresh clippings in the marbleized vase. THESE pages are a warm coppery, metallic gold, which adds a touch of glam! 3 – The House Beautiful Book of Gardens and Outdoor Living – I found this vintage book at the local thrift store for $1.50. House Beautiful is one of my favorite publications and this particular book was published in the 1950’s. The edges are a bit tattered and worn, but it totally gives it character. Plus, I was gushing over the black spine and gold typography. 4 – Illinois – A crisp white cover, with black lettering, titled with our home state is simply a classic, stack-able coffee table book. I put together a post last year rounding up some of my favorite coffee table books and I do own *most* of them. They are sprinkled throughout the house and others are stored away in my decor stash closet. I can grab a few out when I feel it’s time to do a swap on a shelf or table! Phew. Can you tell I love coffee table books?! In this look, I have a small gold, oval-shaped tray with a few small items setting on it. They always say clutter looks better when it’s coraled and on a tray, so that is what I do! Larger trays work well on coffee tables to house books, etc. and I’ll show you an example in the second look. Plus, hello! Gold! I like to add items with a unique shape or look when styling various spaces. 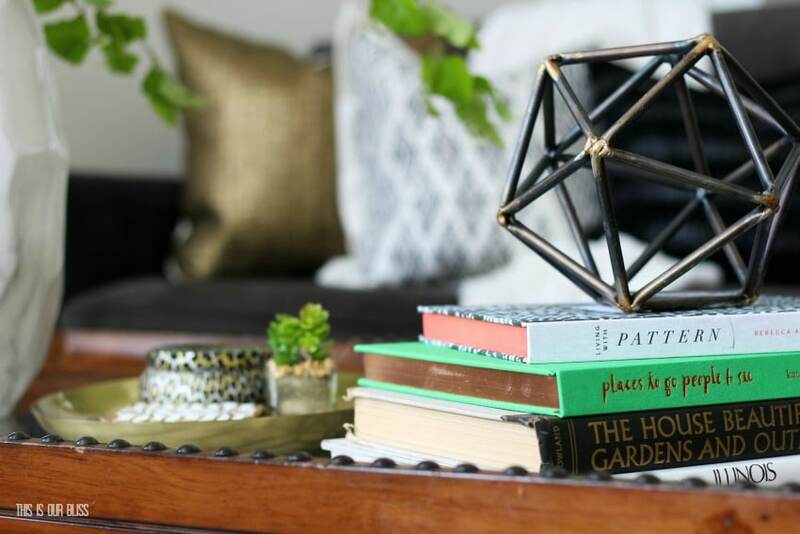 This geometric metal orb has great dimension, is good size and it has a hint of gold at the joints, but not too much bling if you’re looking for a less luxe look. 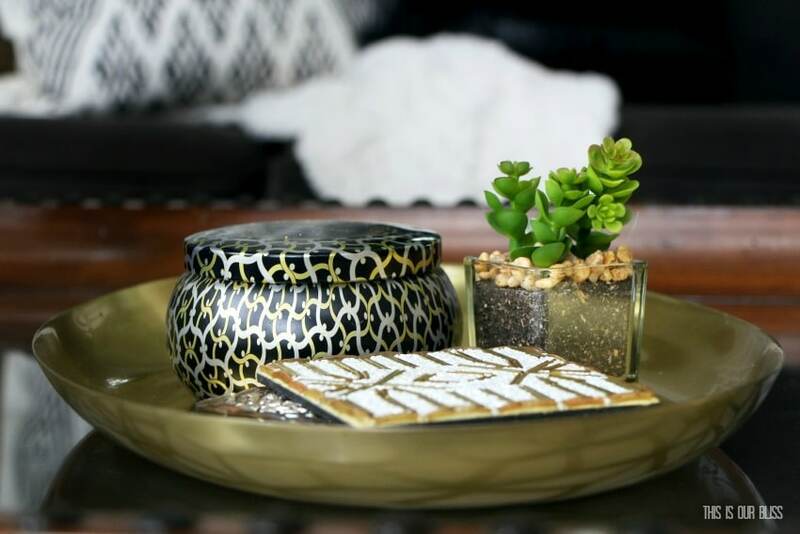 Moving on to the second styled table… we’ll call this one the Chic + A Pop of Color Look! This tray is all sorts of glam with the gorgeous brushed brass finish, the unique cut-outs in the metal and the mirror inset. It’s also big enough to stack a few coffee table books inside and provide a nice tall base for a vase of fresh flowers! Yep, more books! I added a couple additional ones to the mix to add maximum height to elevate the flowers. Here I used a small round vase filled with hot pink Sweet William stems from Trader Joe’s and I also have a small, clear vase of white roses. 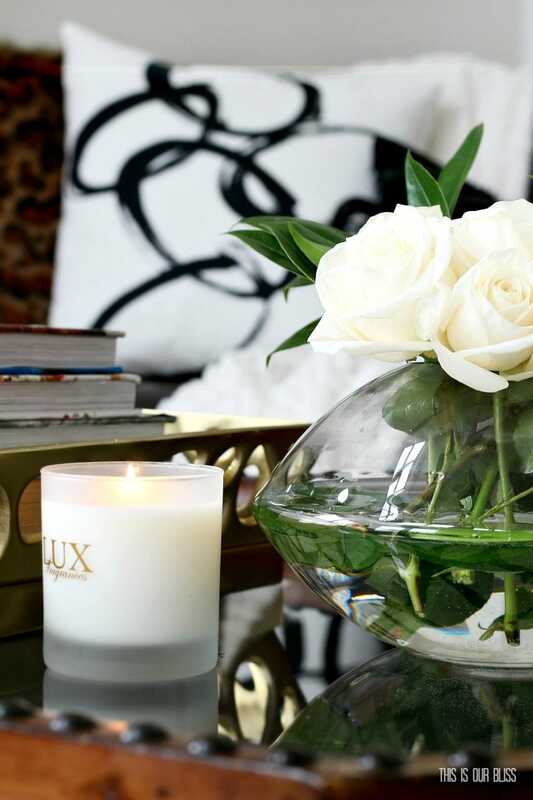 You definitely do not need to use TWO different flower-filled vases to achieve a chic and feminine look. One will absolutely do the trick!! I simply hadn’t bought flowers in a little while and couldn’t make up my mind, so I settled for both! I decided to place the pink flowers in the center as to be the focal point and “pop” while the white roses on the side helps balance out the other white items on the opposite side of the table. Candlesticks or taper holders are always an elegant touch to any tabletop. 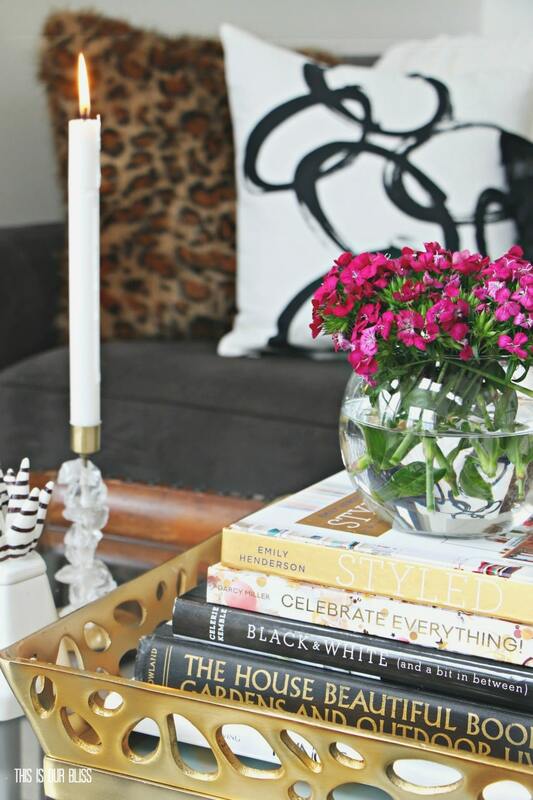 These crystal and gold ones are from Anthropologie, but I typically use a slew of thrifted brass candlestick holders like you saw in my Tapers & Tulips Spring Tablescape. There aren’t really rules to the number to use, but do make sure you have at least 2. It’s nice to vary the heights if possible, but if they holders are the same size, you can easily use different sized tapers. Add something interesting. Something visually appealing, yet unexpected. I could have easily placed a candle jar or even a small trinket box next to the candle holders, but instead, I placed this white ceramic jar with a funky spiked lid. It even has a subtle stripe on top and you know I love that! 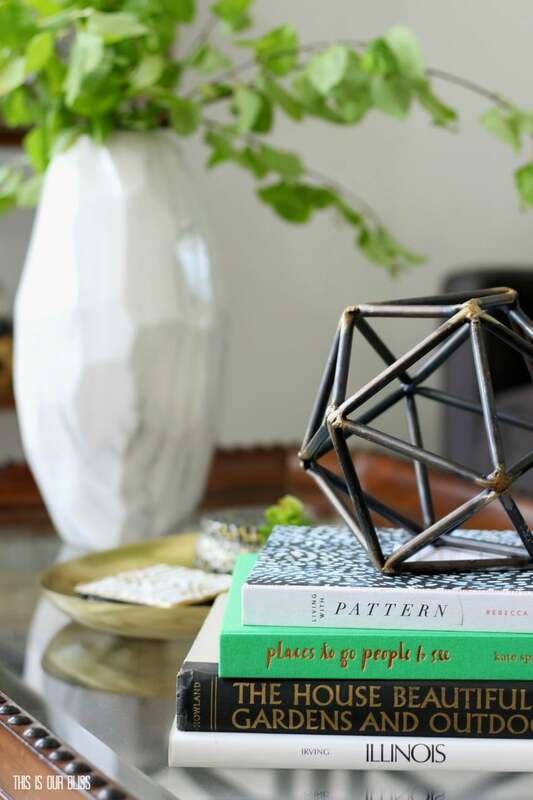 The main objective I had in showing you how to style a coffee table two different ways is that you can get creative, use what you have [or go outside and find something!] and mix it up! You can swap out any of the key elements from LOOK ONE and add them to LOOK TWO. Repeat after me, “There are no rules when it comes to decorating!”, only tips to help guide you to achieving the look you want. If you want simple, then try the first look. 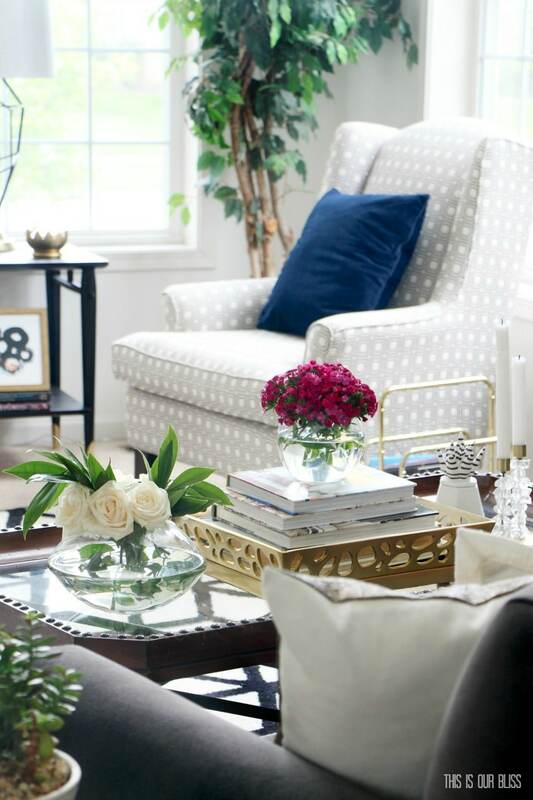 If you want to glam up your space a bit, then opt for the second look. Add the flowers and some gold [and more gold!] and call it a day! 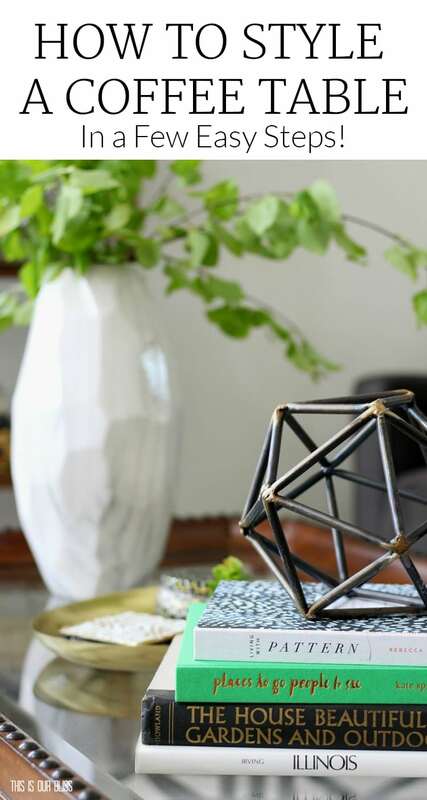 If you’re looking to scoop up a few new coffee table styling accessories, take a peek below at some of the items you saw in my photos as well as some of my favorites. Use them on your bookshelves, mantels and other table-top surfaces throughout your home! What spaces stump you the most when it comes to decorating? Is it the overall room or the tricky small surfaces? !